Download the Looking UP magazine here. 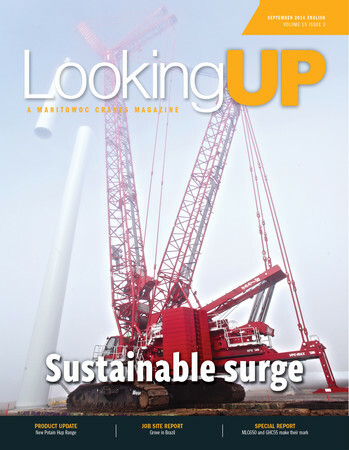 A look at how new cranes, such as the Manitowoc MLC650 and the Grove GHC range, are dramatically changing the renewable energy industries, increasing efficiency and decreasing costs. An in-depth examination of the new Potain Hup 32-27 self-erecting tower crane and how its groundbreaking new features are sure to increase return on investment for lifters. A study on how a crane’s line speed can increase efficiency on the job site and overall construction schedules. The opening of Manitowoc’s new Product Verification Center (PVC) in Wilhelmshaven, Germany, and how it will influence future crane products. All of these great stories plus reports from the world’s most fascinating job sites. © 2019 Paterson Simons & Co. (Africa) Limited. All rights reserved.